Easter was pretty much a non-event around here– we went out to dinner the night before and spent Sunday mostly packing and doing other practical things. However, it was a special day because I was able to eat candy again. And these things? Sooo good. 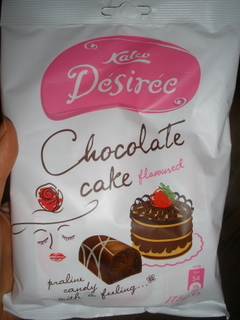 I wouldn’t say they taste like cake so much as they taste like the ganache you’d put on a cake. They’re rich with well-balanced sweetness, and even though they taste like chocolate ganache they’re more firm– like a chocolate truffle without the slick, melty texture. I picked up another bag today to share with my family in the States :).